Attorneys and paralegals requiring a simple, affordable and comprehensive solution for review, production, and trial preparation. Pros: The speed the program can search for a document; the customization of coding features; the staff. Cons: The format changes often, e.g. color scheme. I find the new format of the Nextpoint Training tab to not be as user friendly as before. Overall: I've used Nextpoint since approximately 2011. I've seen it evolve and improve its capabilities and features over that time. I've formed long lasting relationships with staff and can depend on them to answer my questions - even if I've asked the same question before. Comments: Pros: Cloud-based platform, works on any browser/any device (no plugins required), easy to manage, easy to use. Reasonable pricing. Most data imports can be handled by just about any user type. A great step up from our legacy platform without the high cost of some of the other popular platforms. Cons: Production tools are a little clunky and basic (about to see a major overhaul on 12/12 however and the early reviews look fantastic). Some data imports require additional massaging and documentation around importing some data sets is a bit ambiguous. We spent nearly 24 months looking to replace our legacy document review platform which had fallen out of support and development, and really wasn't able to fully meet the challenges of discovery in an ESI world. After an exhaustive process, we decided to give Nextpoint a try, and for the most part we are very pleased. It offers an intuitive interface that is very easy to use, cost-effective pricing, and the big winner is that it is all based in the cloud. Is it a perfect system - no. However we have had experience with some of the more popular platforms recently and I have heard from users that Nextpoint is just much easier to use and makes more sense from a review and from a case management standpoint. Nextpoint has been working very hard behind the scenes to revamp the production tools in the platform, and I am excited to see these launch at the end of this week. This will be a big change for the better! I think with a few other tweaks and enhancements, and a small rewrite of their documentation will go a long way to keeping our users content. Pros: Easy searching capabilities, simplistic loading, and great customer support. Cons: They just fixed my major complaint which was the ability to highlight directly on a document. While there may be functionality that does not exist, I find the customer support to be extremely good at talking through problems and helping to implement solutions whether it be through feature requests or simply teaching me a different way to do things. Overall: I have been in litigation support since 2003 and used a variety of products over the course of my time. After several major players started to become less popular I looked for some alternative cloud-based solutions and NextPoint has been a great option. It is very easy to use, has amazing customer service, and most importantly the team listens to customer feedback and provides solid solutions to ensure that their software does what their customers need for it to do. It is always improving and a great tool for litigation teams. Pros: Nextpoint review is an excellent doc review software, especially when you have a case with tens or hundreds of thousands of documents. The folks at Nextpoint are super amenable to feature requests and hearing from attorneys on what they can improve on; most importantly, they actually listen and make the features or improvements where they can. Cons: Nextpoint is in its (relative) infancy so there are a few kinks and features that can be improved on. But as mentioned in "Pros," they are great at listening to requests and comments about how to improve they software and quickly work to implement changes. Overall: Streamlined doc review. Cloud-based so I can use it anywhere. Pros: The customer service is amazing. I often have to export groups of documents in a rush and rely on the Nextpoint team to help. They always do a great job. Cons: I don't use Nextpoint every day so I feel like there are a lot of features I don't take advantage of because I am not as familiar with them as I could be. The training sessions have been helpful but if I don't use the features discussed during training right away I forget what we covered. A cheat sheet or short handbook might help! Overall: There is still a lot I need to learn but the training sessions have been really helpful. There is so much in the software that I feel I am not always using it to its full potential. Hoping to become more familiar with all the features the more I use it. Thanks for the feedback Samantha! The Nextpoint Help Center (support.nextpoint.com) is our online handbook for using the software, but we also recently put together a New User Guide you may be interested in checking out. It's the first item in the "Getting Started" section. Pros: Ease of use, time-saving strategies, and efficient handling of documents. Cons: It could use a few minor updates here and there - I'd like to select one redaction style for an entire production. It would also be great to have more support with users who have Internet Explorer as that is my firm's preferred web browser. Overall: Nextpoint has saved me more time than I could have ever imagined spending on certain tasks. As a champion for my firm's clients, I try to save them time and money wherever possible, and Nextpoint is a great product to do just that. Hi Shannon, thanks for the suggestions! Our development team is currently working on the Redaction styling issue you raised. Nextpoint is compatible with IE, but some features may not work as well on older versions of IE as they do on our recommended browsers. If you haven't done so already, we recommend upgrading to the latest version. Pros: What I love about this software is that it allows you to review legal documents with unilimited data hosting and it allows you to organize it and modify it the way you want to and is easier for your team to view. It also allows you to keep track of all the documents, mails, attachments and threads. It also gives you the tranquility that the uploaded files are secure. Cons: It is not a very friendly software, for me and my team it was a little bit hard to take control over the platform. Tremendous asset in document management for litigation. Pros: The best part is the ability to search for terms. It allows me to easily and quickly find and utilize relevant documents out of a massive production. Cons: At times it can be a bit unwieldy and you really need to practice and build a knack in setting up folders. Overall: Allows me to be more efficient as a litigator. Pros: Nextpoint is an efficient way to gather all documents in one software. It was easy to use and a great tool for discovery needs. Cons: Nextpoint is not always user friendly. The keyword searches does not always produce all the required documents. Thanks for the review! We are always happy to listen to constructive feedback from our users. Nextpoint's advanced search "wizard" can help you build the perfect syntax for quickly narrowing down results. You can also save your searches with one click. We are always happy to jump on a call with you for a quick search training if you need more help, and there are great search tips on our support site here: http://support.nextpoint.com/hc/en-us/articles/205952436-Searching-Tips-FAQ-s#advanced. Overall: I think the services of Nextpoint are very good for our organization. The only thing that is missing is a sorting filter by date. I use Nextpoint to find the most recent writing on a certain topic and I cannot always find the most recent writing easily. Apart from that, the software is great! Hi Nicole! To sort by date, make sure "Document Date" is enabled in the Grid View template you're using (you can find these templates in the Settings tab). Date sorting is also available in Classic View under the "Change Sort Criteria" drop-down menu at the top of the page. I was very pleased by the power of the Nextpoint platform. It's a great product. Pros: The software was easy to use and flexible enough to adapt to the needs of my specific case. The pricing was also very reasonable. Overall: I had a case with significant document processing and review needs. Nextpoint did everything I needed it to do. Overall: I love Nextpoint's trial prep capability, as well as its automatic OCR function. Its ability to search is extremely helpful when you are working with thousands of pages of document productions. Pros: The fact that in the deposition highlighting you can have all designation colors present on the final product. Cons: Just that the clear button is too close to submit. Overall: The one thing that I think is so problematic is that the clear button is right next to the submit button in the deposition highlighting. Since the clear button gets rid of everything you've done and it cannot be recovered (I have done this and called customer support), it seem like a poor choice for the clear button. Or at the very least, have a pop up making you confirm that is what you want to do before all is lost. Cons: The cost can be high since not all clients will agree to pay for the service. The inability to upload more than just one file at a time is also problematic. Pros: Easy to use--I like the functionality. I thought the deps were organized easily. I love the advanced search feature. Cons: Needs work for dep designations--need functionality for courts that do not allow color filing. This was an issue in our trial. Love it! Great customer service and super user friendly. Pros: After searching for months for an affordable and easy to use software, Nextpoint was definitely the winner! The software can either be handled by your in-house IT or by Nextpoint. They offer extensive training, but if you have any questions Nextpoint's customer service is astounding. This software has definitely made discovery review less tedious. Overall: This software makes ediscovery review a breeze. Overall: i think the potential np has greatly exceeds what it is currently capable of. i think the front end loading takes way too long. i think making features available without having to move between tabs would be huge. like being able to create a folder on the fly, rather than doing it beforehand then associating documents with it. also, if i'm searching for a word or set of words, i would prefer to not have to re-enter those words once i'm in the document that my initial search took me to. i love the program, but i would like it to be more user friendly. thank you and happy holidays! Comments: We looked at a number of solutions for our complex document management/trial prep and Nextpoint represents the cutting edge. The tool works well to manage, sort, search and tag large volumes of evidence and it has a ton of customizable features, settings, and templates for displaying, exporting and stamping. Designations in the Prep Tool are a breeze to setup and manage, and it exports to Trial Director. I love all the color customization as well. Compared to other products out there, it is very affordable as well which helps with managing case costs. Lastly, the tech support and response time to questions is amazing. All the benefits of a much larger company, with a very personal, customized relationship. Definitely worth your time to try and compare. 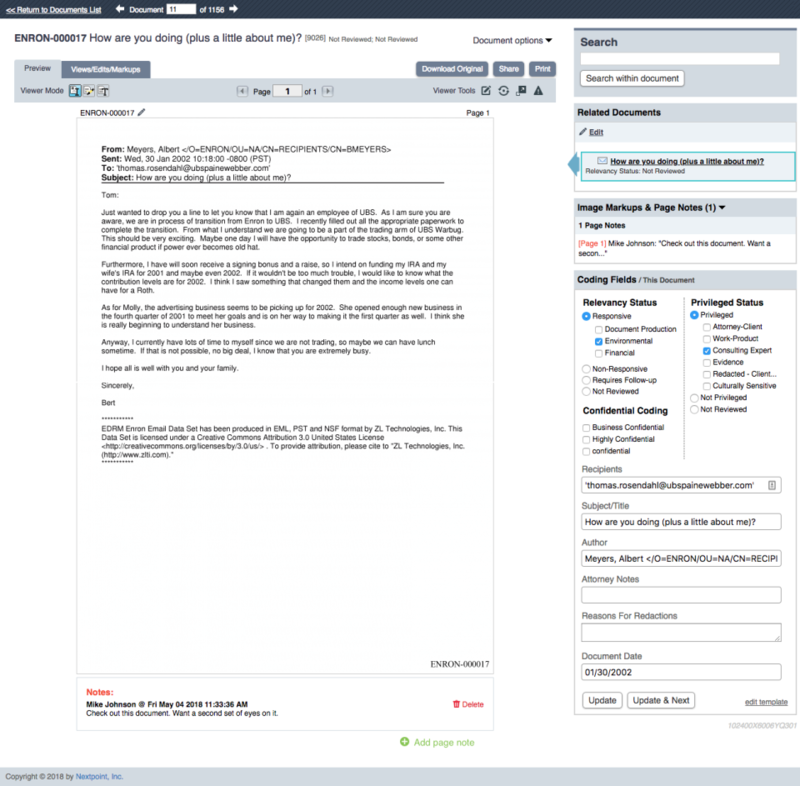 Comments: Nextpoint has been an extremely useful and overall user-friendly document review tool. One of the best features about this program is that you can divide the workflow into multiple folders that can then be assigned to various reviewers--making it easy to keep track of who is doing what work. The ability to customize "call" buttons, add tags for certain issues, and change the stamp on a redaction is also very useful. The only bugs I've run into are occasional issues with documents not appearing as they should, but once contacted, Nextpoint has been quick to solve. Only took me about an hour to learn how to use most of the features of the program too--a big bonus when you're working with limited time. I would recommend to others. Comments: I love using Nextpoint, I usually use it for designating from depositions to be used at trial. I will have a paralegal upload all of the depositions to Nextpoint and then I can go through and highlight which portions I want to designate with ease, as well as which portions the other party wants to designate. Then I can go through and highlight my objections to their designations and state my reasons. The judges love it, they can see clearly what objections and designations are being made and who is making them. Since everything is in a different color they don't have to flip back and forth between Defendant and Plaintiff designations, everything is in one spot. NextPoint is easy to use. Pros: I like the color coded designations and the ease with which you can label new designations. Courts have found it very easy to follow along. Cons: Sometimes making specific line edits within a designation can be challenging. Rather than adjusting the whole set of a designation, it would be great to be able to deselect a line or two (subset) of a designation. My overall experience with this software is good. Comments: The only con is tagging documents. I do not like how this program tags documents. When a document has multiple tags, I found that it removes your initial tags so you have to remember all the tags you checked. Hi Tammy! Thanks for the honest feedback. 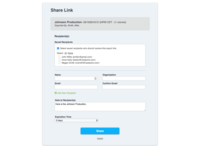 We hear you about the bulk document tagging feature. We're currently exploring how to give users the option to make additive or subtractive bulk edits without muddying up the interface. When we're finished, that ability will be available to everyone. If you'd like to add some more details on what you'd like to see us improve, feel free to submit a support request ticket at support.nextpoint.com. Thanks again! Pros: It is helpful in searching large productions and organizing voluminous documents. Cons: It can be very expensive and the fees mount up quickly. Overall: We are a boutique firm and handle a limited number of matters in litigation. However, when we do there is always a large number of documents. Nextpoint was one of the first programs compatible with Mac so we signed on with them. Over the years the costs become excessive. We have tried to work with them, but their contracts are never quite what they say they are going to charge us. When educating future paralegals in e-discovery software, use Nextpoint! 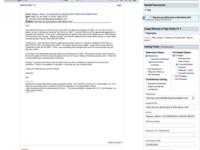 Comments: As a paralegal educator, I am impressed with the ease and functionality of Nextpoint's e-discovery software. My students are able to quickly and efficiently upload documents and perform comprehensive searches. The training videos and webinars are an added bonus to help my students maximize their learning. And, of course, the web-based program makes accessing Nextpoint a breeze both in and out of the classroom. Additionally, and equally as important, is the excellent customer service I receive from everyone on the Nextpoint team. The professionalism, expertise, and overall kindness makes working with my Nextpoint team a true joy. Comments: I've worked with Nextpoint on a few larger document review projects, in a capacity both as a sole reviewer and using Nextpoint while managing a larger group of reviewers. The platforms have numerous customization features that allow it to adapt to a range of objectives, and that can be employed without sacrificing its utility. The Nextpoint customer support team is very helpful and responsive to inquiries and issues, and has quickly answered our questions and understood our objectives., and have been good partners as we seek to drive efficiency in the document review, management, and preparation aspect of our practice. Comments: Nextpoint is a good ediscovery tool at a reasonable price. It is intuitive and easy to use. Some of the advanced searching is presently a little clunky (e.g., hard to search more than one grouping of documents at a time), but it is manageable and Nextpoint continually works to improve the tool. Our firm uses Nextpoint regularly on cases both small and very large with good results. The customer service is fantastic--people have been very responsive and, when we've used some of the add-on services, have completed their tasks efficiently. They have also responded to our suggestions regarding functionality improvements. We have only used Nextpoint for review, not trial prep. So far, it has met all our needs. Pros: The customer support is highly responsive and excellent, as is the value. Nextpoint is geared to meet the needs of a small firm like ours. Cons: Some of the search features are not intuitive, but I also get fast answers. The highlighting color system does not seem to have enough bright colors for my taste, but I may not have figured out how to maximize the use of that feature. Overall it is very easy to learn. 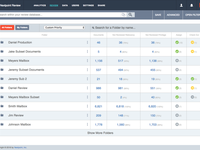 Overall: We absolutely needed a eDiscovery search platform for one of our larger cases. All the other eDiscovery platform providers were far to expensive for us and our clients. We needed to be able to review enormous amounts of data, and we are able to do so. We are very satisfied. Comments: I had the opportunity to extensively use NP in a recent case. 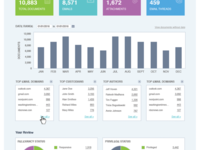 The biggest pros were speed, very customizable within the review panels, and support was very responsive. Support seems to be personal enough that they can add features that we needed during the project. The multiple uses of tags were also very helpful. The biggest detractor was the process to download documents from the tool. It was a bit cumbersome but does export with underscores for every file name which made it easy to add to OnCue for trial presentation. Recommendations to other buyers: Overall a great experience and would use again. Pros: How easy, (and fun! ), it is to use. Cons: The browse button defaults to the beginning too often. Overall: I love Nextpoint. It is the fastest, most efficient way to enter designations into a transcript, and certainly, results in the most legible end product. My only complaint is when I'm double-checking my entries in the designation box, and try to click the arrow to move to the next page of the list, it will frequently throw me out, and I have to start from the first page and page back to the point where I left off. Other than that, no complaints at all. Comments: Most discovery vendors make you want rip out your hair in frustration. Nextpoint is completely different. I love how you can customize the database to suit your case and review. The software is thoughtfully designed - you can easily re-stamp documents or change things around if something gets messed up.They are so cost-effective compared to other companies. Some companies charge you to download pdfs of documents or bulk print - Nextpoint never does that and they make it really easy to do on your own. And everyone I've dealt with at Nextpoint is extremely kind and attentive. Comments: Over the past couple of years, our commercial litigation firm has used a handful of document review, e-discovery, and litigation management platforms. Nextpoint is by far the best company we've worked with, and we currently utilize its services for a significant number of matters in our firm. Nextpoint provides powerful features for every aspect of litigation, from early case assessment all the way through trial preparation. Further, Nextpoint is supported by an extremely knowledgeable and responsive team that has proven very helpful to us on countless occasions. Comments: We are very pleased with Nextpoint. I have experience with many case management software applications, and have found Nextpoint to be among the most cost effective, comprehensive, mobile, and user friendly systems available. 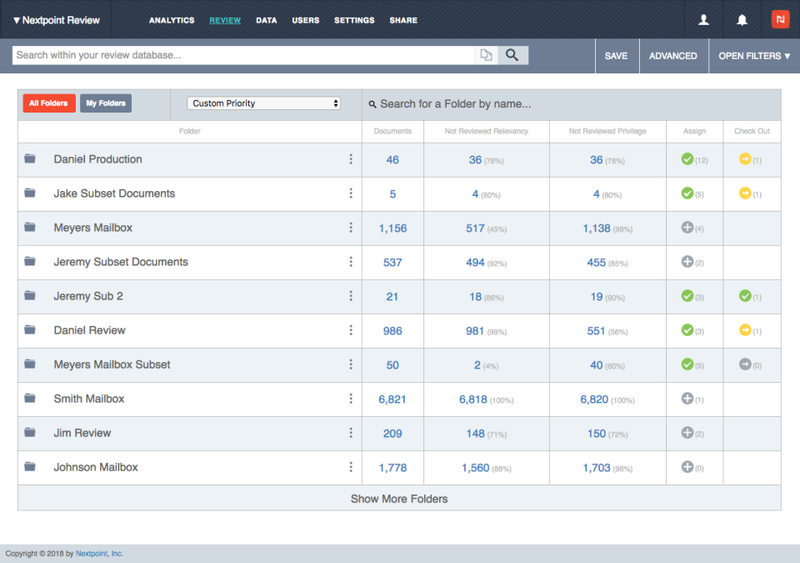 Its intuitive, organized format has saved us many hours of time reviewing and processing documents. The ability to access our case files when on the road (and over various devices) is critical for a practice such as ours. Plus it is backed by a customer service and support staff that is extremely responsive. Keep up the great work. Good software for litigation efficiency. If you've never tried software like this -- do it!! Comments: My firm recently used Nextpoint to process over 50,000 documents to respond to discovery production. Nextpoint does a good job reading the documents that are imported into it, and provides a lot of capability to tag/label the documents with custom fields. You can also redact documents. Some of the navigation options could be improved, but it is not difficult for document reviewers to learn their way around. I cannot imagine being without Nextpoint or something like it for a large document production -- it's an incredibly useful tool. Cons: The viewing theater did not always allow proper zooming to review documents that were not of a traditional formal. The easy fix was to download the entire document and open it in its native platform. Overall: The software worked well. It was easy to use, simple to learn, and glitch-free. I had no issues requiring customer support, so I cannot speak to that category. Otherwise, it did the job. Overall: Nextpoint has been really easy to use. We have a rather large case we are working on and it's great because each person has their own file and documents. We can mark which documents are new and which ones need to be reviewed. Comments: My company chose Nextpoint for its great reviews, competitive pricing, and range of services. Unlike many of its competitors, Nextpoint offered trial-oriented services in addition to discovery-oriented services. Although we never ended up converting our "Discovery Cloud" to a "Trial Cloud," I was completely satisfied with Nextpoint from the beginning of our project to the end. I was particularly impressed with their customer service. I would definitely use Nextpoint again in the future and recommend them to anyone. Pros: Very user friendly compared to other platforms that I have used previously. The customer support is by far the best I've ever had! 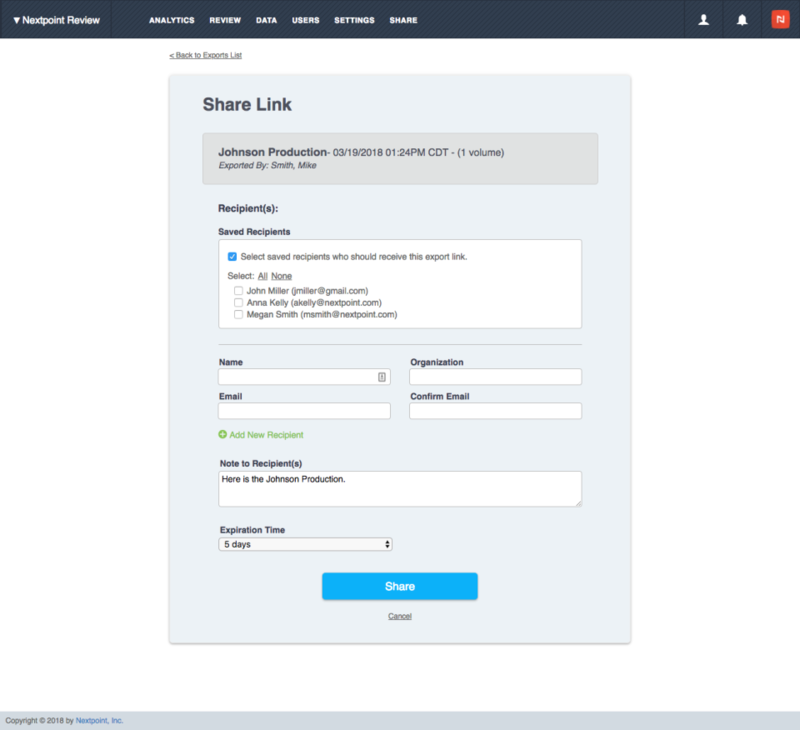 Cloud-based makes this platform so easy to use while out of the office! Cons: I would prefer all emails automatically attach the attachment when editing in a Bulk Action. I think that should be the standard setting as opposed to having to click Grouped by email family, including related documents and then clicking Email-Family (Emails and attachments). Overall: Saving time with review, fast cloud-based action! Pros: THIS SOFTWARE IS VERY USEFUL FOR LAWYERS. 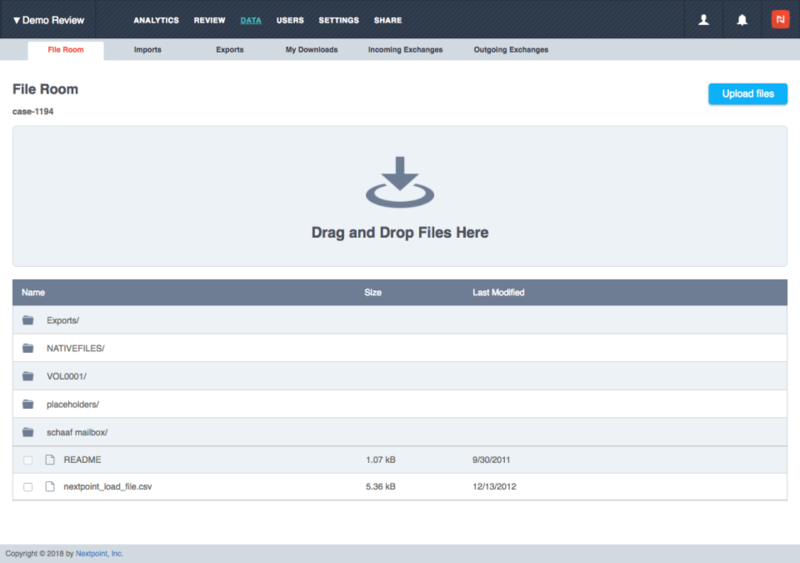 iT ALLOWS YOU TO KEEP TRACK AND TO UPLOAD DOCUMENTS AND ATTACHMENTS OF YOUR CASES SO EVERYONE IN YOUR TEAM CAN SEE IT. ALSO, IT HAS A FEATURE TO REVIEW THE CASES YOU ARE MANAGING WHICH CAN BE HELPFUL FOR OTHER MEMBERS OF YOUR TEAM. I BELIEVE IT IS A GREAT TOOL TO HAVE IN OUR LAW FIRM. Cons: It is not very friendly for everyone on our team. But like everything in life, it only requires practice to get to know how to use it. Overall: Use it if you are a lawyer! Comments: As a boutique litigation firm (4 lawyers), we've had an excellent experience with Nextpoint. The service has scaled well to our particular ediscovery project needs. It's easy to learn and use and helped us efficiently work through large amounts of records. The customer service has been great and having a dedicated customer support person to field any issues is a nice touch. Lastly, being a cloud-based service, it complements our other legal software such as Clio (for timekeeping). Easy to use, intuitive, and constantly improving. Comments: After only a few short training sessions, I felt that I could perform most tasks within the software. It's easy to use without sacrificing quality. But the best part about the software is that it's flexible. I can run a simple PDF production if I'm in a time crunch, or I can work with Nextpoint's representatives to create a full-fledged ESI production. And Nextpoint's client-service reps are second to none. They solve any technical or logistical problem you throw at them. Pros: Web-based, cost controlled and easy to onboard users. Cons: Lacks a bit of the flexibility and management we usually desire, though changes are being made to adapt. 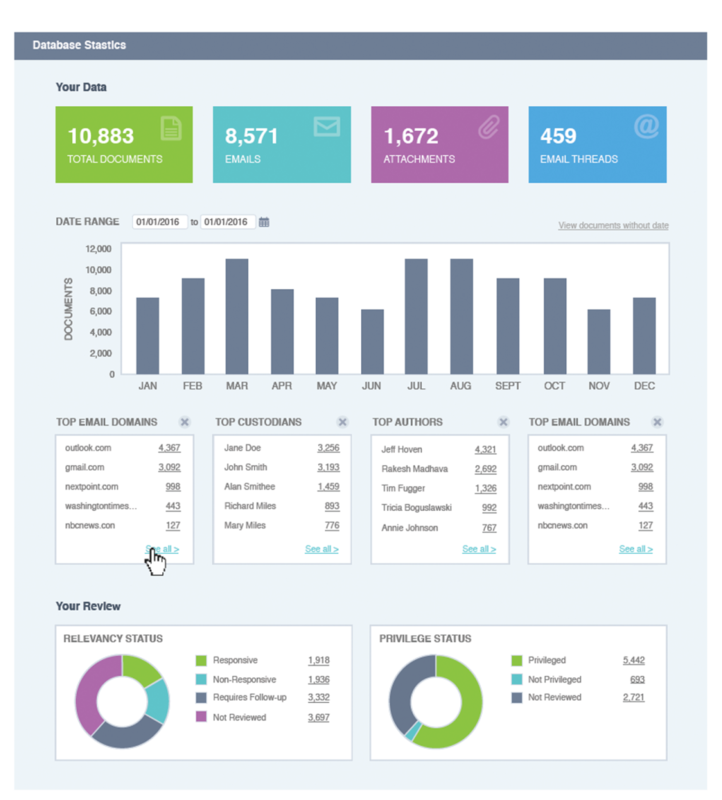 Overall: We started with Nextpoint in May of this year to fill a need for our Mass Tort cases post discovery and into trial prep and so far we've had a great experience working with the software and the support team. Would recommend our exposure to the software to anyone. Comments: I am not the most computer savvy person although I am working on computers all day as a paralegal. This software has helped greatly with our discovery document review & production. I could never have figured out the software or how to use it without the help of your trainer Annie, she was absolutely amazing & so patient with me! I know that if I need any assistance in getting my job done I can contact Nextpoint and get the help I need! Comments: The team I have been working with this past year has been amazing. The platform is very user-friendly. If I have any trouble or questions, or even if I screw up or don't quite understand how something works, my main contacts are very good with helping me work through it. I'm very excited to actually get further into what this ediscovery program can do and really hope I can get the word out to my firm so we can keep moving into a paperless world. NextPoint is a tool that even Luddite's will use. Comments: It is one of the more intuitive document management tools with which I have worked. The attorneys with whom I work can review and code documents with very little front end training. It is flexible in its ability to add coding fields and folders as your review takes shape. In addition, NextPoint personnel are great partners in helping you to be as self-sufficient as your firm's support staff is capable in order to minimize client costs. Pros: The ability to customize your own fields. Cons: The removal of the reviewer metrics. It was nice to be able to see your progress. I hope that this feature will be restored. Overall: We used Nextpoint to help with a large ESI production (150K documents). The software definitely helped streamline the process. We had a few glitches, but Nextpoint's customer service was available to assist. Loved the software, great customer service. Comments: The customer service I received from Jim Lancaster was top notch; quick to respond and engaged with what his clients are trying accomplish. If I asked him a question about something not in his wheelhouse, he either found out quickly or put me in touch with whomever knew the answers. I also found the software to be very intuitive and easily adaptable/customizable for my specific purposes. Would definitely recommend. Comments: Nextpoint has been an awesome addition to our MDL practice, hosting thousands of exhibits for multiple trials and allowing access to unlimit ed users. It's affordable and I love not having to access it through a remote desktop. You can pull it up on any tablet, ipad, or computer and the double security gives me and my clients peace of mind. It is extremely user friendly and the new updates keep making it easier. Comments: The people at Nextpoint are very friendly, helpful, and make it much easier than I expected. I would highly recommend this service to anyone with this need. After reviewing other options and trying out other products (Relativity, Concordance), we found that Nextpoint is the best option. The product speaks for itself, but the customer service is unmatched. I can't wait to visit their office in Wrigleyville! user friendly; very manipulable; customization oriented; beautiful interface; customer service is top-notch; much smoother than other platforms i've used in the past; pretty revolutionary for "doc review"